lake was nice.The breakfast was bad cold and really not much there to eat. Everything was great! Property was great! Plenty of parking available at all times. Where to find Kalamazoo hotels near an airport? Where can I find hotels in Kalamazoo that are near tourist attractions? From the budget level to the more exclusive, Kalamazoo offers an amazing range of comfortable short- and long-stay accommodation options. Expedia lists at least 30 comfortable places to unpack your bags within a 0.1-kilometre (0.06-mile) radius of Kalamazoo's center. Kalamazoo offers visitors a number of centrally located accommodations, such as the Radisson Plaza Hotel at Kalamazoo Center and The Rosenbaum Bldg. Portage offers 4 Expedia-listed places to stay which makes it the part of Kalamazoo with the most hotels. It lies 10 kilometres (6 miles) from downtown. The Courtyard Kalamazoo Portage and Days Inn & Suites Kalamazoo are just some of the hotels in and around Portage. Another popular place to stay is Battle Creek. Battle Creek is where you'll find the Holiday Inn Battle Creek and Fairfield Inn by Marriott Battle Creek. Or, try Coldwater, where you'll find the Hampton Inn Coldwater and Quality Inn & Suites. Sturgis is 55 kilometres (35 miles) from Kalamazoo's downtown, while Three Rivers is 40 kilometres (24 miles) from the center of Kalamazoo. 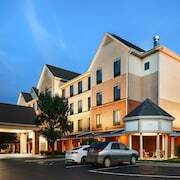 The Hampton Inn Sturgis Lagrange and American Inn are in Sturgis, while Holiday Inn Express & Suites Three Rivers and Super 8 Three Rivers are located in Three Rivers. Those traveling on a budget will be delighted to learn that there is a solid selection of cheaper hotels and apartments in the vicinity of Kalamazoo. 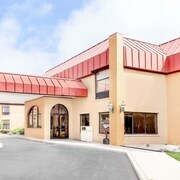 The Baymont Inn & Suites Battle Creek Downtown is 35 kilometres (20 miles) from downtown, while the Baymont Inn & Suites Kalamazoo East is 5 kilometres (3 miles) away. 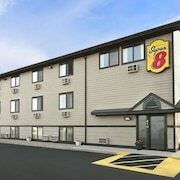 Alternative lower-cost room options include the Baymont Inn and Suites Kalamazoo and the Super 8 Three Rivers. The Delano Mansion Inn is situated 35 kilometres (21 miles) from the heart of Kalamazoo. Another accommodation option is the Kara's Kottages, which can be found 1 kilometre (1 mile) away. Two other places to stay are the Staybridge Suites Kalamazoo and the Hampton Inn & Suites Kalamazoo - Oshtemo. Once you have got to know Kalamazoo, why not explore a bit further afield? The Southwest Michigan region has plenty of great the other cultural and scenic and cultural delights to offer. Check out Southwest Michigan's art galleries and admire the area's forests. In this part of United States of America tourists may also partake in cycling and shore fishing. 75 kilometres (46 miles) to the north of Kalamazoo is Heartside District, where you can spend the day visiting Urban Institute for Contemporary Arts and Spectrum Theatre. The JW Marriott Hotel Grand Rapids and Courtyard by Marriott Downtown Grand Rapids are just some of the Expedia-listed accommodation options in Heartside District. Or, you could stay in Grand Rapids, 75 kilometres (47 miles) to the north of Kalamazoo, where you can pick from the Amway Grand Plaza, Curio Collection by Hilton and Holiday Inn Grand Rapids Downtown. While visiting Grand Rapids, set aside a little time to check out the John Ball Zoo and Grand Rapids Art Museum. Kalamazoo-Battle Creek International Airport is a convenient airport, and is located 6 kilometres (4 miles) away from Kalamazoo. Conveniently located Expedia-listed hotels include Residence Inn by Marriott Kalamazoo East and Four Points by Sheraton Kalamazoo. What are the most popular Kalamazoo hotels? Are there hotels in other cities near Kalamazoo? What other types of accommodations are available in Kalamazoo? Explore Kalamazoo with Expedia.ca’s Travel Guides to find the best flights, cars, holiday packages and more!